Clever Energy Boilers are Gas Safe and OFTEC registered heating engineers who undertake installations of gas boilers, oil boilers and LPG boilers. For similar replacement boiler companies in this area please visit the Keighley boiler page. 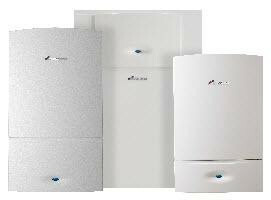 Our business has in depth experience in the supply and fitting of efficient, energy reducing boilers from leading manufacturers like Worcester, Vaillant & Ideal. We have successfully installed over 5,000 boilers in the last eight years across Yorkshire, Lancashire, Cumbria, Humberside, Cheshire, East Midlands & West Midlands. We are Which Best Buy, Trustmark and Gas Safe accredited with stamps of approval from recognised governing bodies and standards. We can offer monthly payments on all our Boiler Installations and up to 10 Year Warranties. Clever Energy were the only company to assist in getting a grant. Decided to deal with them when we discovered their director was the son of a very good friend. It was an advantage that they were situated in our town. They also quoted an acceptable price and guaranteed an excellent service and maintenance contract. The boiler is now installed and working and they did a good job. We are very satisfied. the gas engineer was very efficient and helpful. The company are reliable, prompt and efficient. The sales manager listened carefully to my needs and the boiler and a new radiator was fitted within 10 days (my old boiler was working but needed replacing). The lads who came out to fit the boiler were friendly and skilled (it was not a straightforward job as it had to be fitted into a tight space) and the kitchen was left clean and tidy. I haven't the slightest reservation in giving Millpark a big thumbs up and would recommend them! Good efficient service. Guys who fitted the boiler and the thermostat were very professional and thorough. Work completed within a week and they even managed to drop the price they quoted! Boiler replaced with minimum fuss. Very pleased with the new one, and the service received. Thanks. Lee Gardener Turned up on time, very thorough quote, very competitively priced and very polite.